It took a while for Voyager to find itself and even longer for it to find what was truly special about its crew. The Doctor really is just a cranky hologram the first few episodes. Kes is a wide-eyed child. Tom Paris is a poor knock-off of Riker. And Neelix is an over-protective boyfriend/quirky alien without a whole lot else going on. 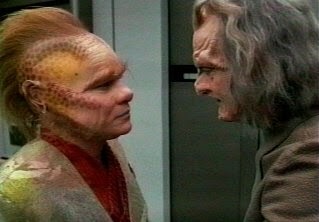 Truly, it isn't until after Kes and Neelix break it off that they both become more interesting, deeper, better characters but the first season episode, Jetrel, is a glimpse at the great stuff Neelix' character would eventually delve into. In this one, we encounter a wartime scientist, Jetrel, who (a few years ago) blew up pretty much everyone Neelix knew and then he makes Neelix' day 9000% worse by letting him know he's also going to bite it thanks to the latent effects from Jetrel's bomb. Eventually we get to the bottom of Jetrel's visit and Neelix comes out a more interesting character in the process. Neelix suffers from survivor's guilt, from the guilt of having made the choice to not fight, from feeling as though he was a coward. He's never forgiven himself. But, he did go back and experience the aftermath of Jetrel's metreon cascade. He worked in the rescue effort and saw firsthand the effects of the bomb. The scene in which he's describing his experience there to Kes is absolutely beautiful. Trek has done a lot of these parable-type episodes over the years, dealing with war or race or social stigma. DS9 dealt with the Nazis in the episode "Duet" and Voyager touched on the bombing of Hiroshima here in "Jetrel." Neelix' memories of the metreon-poisoned population of Talaxia echo the radiation poisoning in Japan and Jetrel's sentiments about remorse and guilt are clearly reminiscent of Oppenheimer's statements after WW2. It's nicely done. Not too much. No one's hitting it too hard here. In classic Trek fashion, it's obvious but gentle. A history lesson without too much lecturing. The characters feel real emotions thanks to the real stakes brought out naturally through the course of the story. The revelations found here would go on to inform Neelix' character for the rest of the series--his feelings of being an outsider, his homesickness for his own people, his guilt at not having been there when his family and friends were killed--all these things will come up again and Neelix' isn't just the grumpy boyfriend, the quirky alien, or the Voyager crew's comic relief any more. Ha! Well, you're entitled to your opinion, KJ, of course! The kinds of comments I'm talking about were moderated out of the blog. Anyway, I think you bring up something really interesting. Why do I like Neelix? He's widely hated--even by die-hard Voyager fans but I've always had a special affinity for him. Definitely something to consider as I continue my watch!